I am sooo excited because I just switched from a doctor to a midwife (yes, at 29 weeks), and my first appointment is this morning. I'll do a blog post on why I decided to switch sometime this week (if I can remember). ANYWAY. I'm also excited because it's the last Tuesday of the month, and you know what that means.... BOOK CLUB!!! Yes, I have been an extremely crappy blogger for the past couple months, so you probably had no idea that today was book club day. Oh, well. I'll get better about things as soon as this baby (and work) are no longer consuming my life. 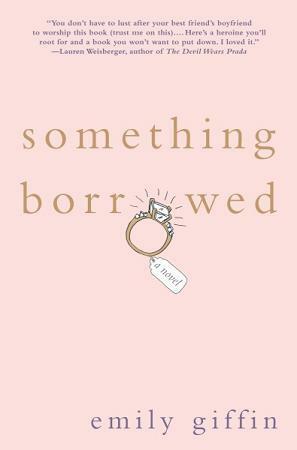 The book for this month was Something Borrowed by Emily Giffin. Of course this review contains what could be considered spoilers. I have a big mouth, yo! I freakin' loved it. Really. I was a little shocked that I was sitting there cheering for a relationship that was borderline adulterous, but you know what? It was true love. I mean, the wedding did eventually get called off, so it's all good, right? Because if they end up together and no one was ever married it's not that bad, is it? At least in the world of literature, where nothing is really real, anyway? Okay, I'll stop trying to rationalize. But seriously - I hated Darcy. I wanted to punch her in her self-absorbed, spoiled little face. What. A. Beep. I was sooo happy when she ended up alone - she totally deserved it. But here is where I tell you that you need to read the sequel (Something Blue). You might hate her a little less after that. I give this book an A. Sure, it got a little borderline with the whole almost-but-not-quite-adulterous relationship, but I loved it. Emily Giffin's writing style is pretty awesome, and while this was clearly a book written for women, it didn't feel like dumbed down chic lit. I'd read it again, I liked it enough to read the sequel (which I also love and whole-heartedly recommend), and I liked it enough to check out some of Emily Giffin's other work. Did you/have you read it? What did you think? Link up your review below! Concerning book club for March: I believe we totally spaced this one - I'll get with Kaylee and Kim and see what the plan is and let you guys know ASAP! Oops! I'm not currently pregnant, but I just left my OB (after 14 years) and switched to a midwife. The difference is amazing! I loved Something Borrowed! Are you going to see the movie? I didn't cheer for their relationship as much in the movie (it felt more wrong), and Ethan was whiny and Darcy was toned down. The author makes a camo! I adored this book. It's been years since I read it, but you couldn't help but obsess over the relationship and think it was just terrible if they didn't end up together. The movie so did not do the book justice. But yes, in Something Blue you totally don't hate Darcy like the first book. I've heard Emily Giffin's other books are good too so I need to check into them. I did not like this month's pick, sadly. I just couldn't get behind any of the characters. Interested to see what next month's pick is, though! I wasn't all that thrilled with this book. First it made me depressed, when she went on about being 30, and I couldn't get over the whole almost adulterous thing. I watched the movie a couple times, and thought that Ginnifier Godwin and Kate Hudson did pretty good tho. I re-read this book a couple weeks ago and liked it just as much the second time around. The sequel is also very good - I need to re-read that as well. Her other books are also good, you should definitely check them out. However, I didn't like the movie they made from this book. I can't remember exactly why right now, but I just didn't. It just wasn't as good as the book! Maybe that's what it was. Dr. Mindy would be very disappointed in you, haha! Sorry, I just got done catching up with The Mindy Project. Now you need to read Something Blue, it'll make you hate Darcy less. I totally loved this book along with Something Blue when I read them. I felt the same about Darcy, but you kind of feel for her in the sequel a bit. It's fun to see her grow. yeah. I hated Darcy. and I hated her even more after reading Something Blue. actually, I kind of hated Something Blue in general just because it was all about Darcy. the fact that it was set in London helped somewhat to redeem it, but I still have largely negative feelings about the book as a whole. I switched to a midwife late in my pregnancy. I'm SO glad that I did! I accidentally read Something Blue BEFORE Something Borrowed, so my opinion on Darcy was totally different than most people's! It was an accident that I totally don't regret. It was super interesting to read the story from her side first! I love Emily Giffin books! Did you know they made a movie out of this one? Not as good as the book, but Kate Hudson plays a pretty good Darcy.